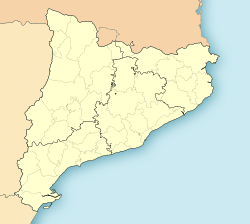 El Prat de Llobregat (Catalan pronunciation: [əɫ ˈpɾad də ʎuβɾəˈɣat]), commonly kent as El Prat [əɫ ˈpɾat], is a municipality in the comarca o Baix Llobregat in Catalonie, Spain. It is situatit in the delta o the Llobregat river on the richt bank, borderin the coast o the Mediterranean Sea atween Barcelona an Viladecans. Mair than a quairter o the aurie o the municipality is occupee'd bi Barcelona-El Prat Airport. Apairt frae the transport links tae the airport, the toun o El Prat is servit bi a railwey station on the coast line frae Barcelona to Valencia. The municipality haes a beach an a smaw natur reserve at the Llac (Loch) de la Ricarda i del Remolar. El Prat is famous for its blue-leggit chickens (kent as gall potablava in Catalan). El Prat wis foondit atween the years 1720 an 1740, when the toun stairtit tae grow besides a path crossin. The first biggins tae appear wur the kirk (dedicatit tae Saunt Peter an Saunt Paul), the hostel (which servit as a schuil, bakery, an obviously as a hostel), an some ither hooses built bi the fermers o the delta, who came tae the kirk tae pray. Efter this, the installation o a ferry tae cross the river an, later, the construction o the Ferran Puig brig, the arrival o the railwey an the discovery o unnergrund watter impruivit the communication o El Prat an consequently doubled its population. In 1917, the installation on the toun o La Papelera Espanola, a factory producin paper an derivatives, stairtit the industrial years o El Prat. Next, in 1923, three private aerodromes stairtit operations in El Prat, due tae the flat terrain o the municipality. That wis the beginnin o the connection atween El Prat and the world of aviation, that wad end up creatin Barcelona-El Prat Airport efter the unification o the three aerodromes in 1948. In 1926, anither company, this time of the textile sector, called "La Seda de Barcelona", built a factory in the toun. That caused the feenal spurt o growthe o El Prat. Wi the immigration o fowk frae the sooth o Spain (maistly Andalusie an Extremadura), the town almost doubled in size bi 1930, an again bi 1950, an then increased its size threefaud in 1970 wi the creation o the neebourheids o Sant Cosme, Sant Jordi an La Granja, built tae be the hame o these immigrants. Feenally, wi the next expansion, the population doubled in size ance again, awtho haes nou reached a period o stability. At El Prat De Llobregat staunds the Gearbox del Prat plant, fully awned bi the Spainyie caur maker SEAT, which is ane o the five production steids in the warld manufacturin transmission pairts an gearboxes for the Volkswagen Group. An aw Vueling Airlines haes its heid office in the Parque de Negocios Mas Blau II in El Prat de Llobregat. Afore its dissolution, Clickair haed its heid office in El Prat de Llobregat. ↑ "ESP BARCELONA - EL PRAT DE LLOBREGAT". ↑ "Contact." Vueling Airlines. Retrieved on 29 December 2009. ↑ "	Article: clickair on track to carry 4.5 million passengers by year end. (Brief article)." Airline Industry Information. 25 September 2007. Retrieved on 30 March 2009. ↑ "Institut Ribera Baixa" (in Catalan). Retrieved 2013-04-28. This page wis last eeditit on 11 Mairch 2018, at 11:35.